Rabbi Haber received his semicha from Rabbi Chaim Pinchas Scheinberg of Yeshivah Torah Ore and by Chacham Avrohom Ochana of Yeshivah Ahavat Shalom. After receiving semicha, Rabbi Haber returned to his hometown of Buffalo, New York in 1979 with his family to found the Torah Center of Buffalo. During his ten years in Buffalo he served as spiritual leader, first of the Amherst Synagogue and later at the Saranac Synagogue. From there he went to Melbourne, Australia where the Rabbi founded the Australian Institute of Torah, an adult education program that ran in almost every synagogue in Australia and was attended by thousands of men and women. Rabbi Haber was then brought back to the United States to become the National Director of Jewish Education for the Orthodox Union. In that capacity he created the extremely popular Pardes Project and many other learning programs. 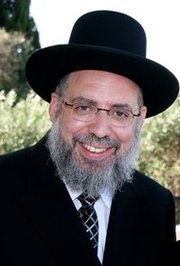 Rabbi Haber was the Rav of Bais Torah Congregation in Monsey, New York where he succeeded Rabbi Berel Wein in leading one of Monsey's most dynamic communities. Rabbi Haber remains a sought after lecturer and speaker and has been instrumental in forming numerous learning programs throughout the USA, Canada and Australia. His easy listening approach to teaching Judaism to men and women of all walks of life has been widely acclaimed. Currently, Rabbi Haber serves as President of www.TorahLab.com.